Bollinger bands were developed by a fellow named John Bollinger. It is an indicator that allows stock traders to compare volatility and relative price levels over a period of time. 1. A simple moving average in the middle. The standard is a 20 day simple moving average (SMA). Standard deviation is a statistical term that provides a good indication of volatility. Using the standard deviation ensures that the bands will react quickly to price movements and reflects periods of high and low volatility. Sharp price increases or decreases, hence volatility, will lead to a widening of the bands. For further in-depth information on the Bollinger Band indicator, this resource contains critical information to help you learn to use stock charts and technical indicators in a clear, simple and concise manner to improve your trade entries and exits. A double bottom buy signal is given when prices penetrate the lower band on the first of the double bottom, and remain above the lower band after the second bottom forms. The bullish setup is confirmed when the price moves above the middle band, or 20 SMA. As seen in the chart above, the stock penetrated the lower band in late February, and then stayed above it on the second bottom low in mid-March. 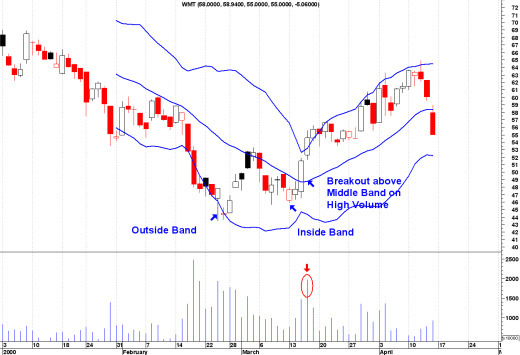 The breakout above the middle 20 SMA band provided the confirmed buy signal. A double top would be the same, but reversed. Band width is also of value. Being able to identify a period of low volatility can serve as an alert to monitor the price action of a stock. Sharp price changes can occur after the bands have tightened and volatility is low. It is the width of the bands expressed as a percent of the moving average. 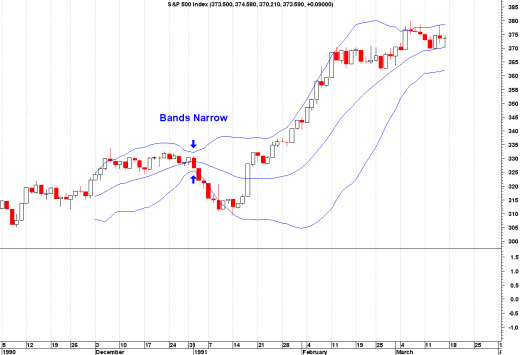 When the bollinger bands narrow drastically, a sharp expansion in volatility usually occurs in the very near future. The price most often starts off in the wrong direction prior to really taking off. The chart above is a classic example. Is there a specific Bollinger Bands Strategy or Technique that you use, that is not described on this page? Here is your opportunity to share your Bollinger Bands expertise and technique, to help and coach other newbie Stock Traders become more proficient and confident on their journey to Stock Trading Success and Profitability! Return from "Bollinger-Band Indicator" to the Home Page: "Stock Market For Beginners"